JumpFm V1.0.0 was rewritten from scratch with focus on performance. Unfortunately, this version is not compatible with older versions. If you had older version installed please delete the folder ~/.jumpfm and restart JumpFm. JumpFm is a minimalistic dual panel file manager for Linux that lets you navigate your file system very efficiently. It is highly configurable and extendible and it comes with some builtin super-powers. Press j to jump directly to your favorites folders. No manual bookmarking is needed, JumpFm will learn where you want to go. 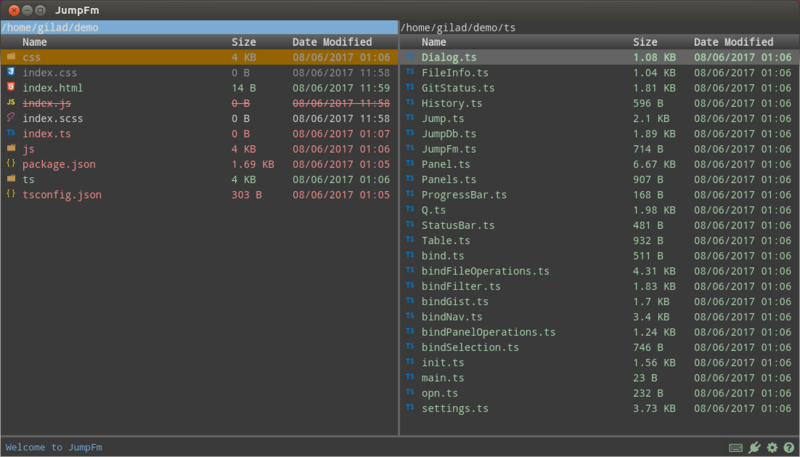 Files are displayed according to thier git status. Powerful plugin system based on NPM. Press f to quickly find the files you are looking for. Press r and all directories are gone. Press it again to bring them back. Press ctrl + g to create instant gist from selected files. Instant gists are public !!! don't gist your private ssh key or any other private information. There are no confirmation dialogs in JumpFm, whenever you hit the DEL key a file is gone. The default keybindings can be configured by editing tde keybinding file. Not all keybindings are available in filter mode. * Holding the shift key while navigating also triggers file selection. All settings files are located under the ~/.jumpfm directory. You can edit the settings files to make JumpFm your own. You can also safely delete the settings folder and restart JumpFm to restore the default settings. Plugins control every aspect of JumpFm. You can enable/disable them, install new once and also write your own. They are located under ~/.jumpfm/plugins and are managed with npm/yarn. Please feel free to open an issue. Want to write your own plugin ? great, it is as easy as writing an npm package. Here is the source code of the jumpfm-clock plugin and here is the full API.